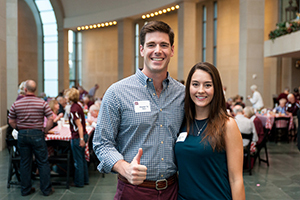 Clay Huber '12 and his wife Jenna '13 at the Texas A&M Foundation's Heritage tailgate. Wearing a uniform with pride comes second nature to Clayton E. Huber ’12. From serving as a Texas A&M University Maroon Coat to a MH-60R pilot and air detachment officer in the United States Navy, Huber exemplifies honor, dedication and selfless service. After enlisting in the U. S. Navy in September 2004 during his senior year of high school, Huber spent four years in the Navy before being selected for the Seaman to Admiral-21 Program. Active-duty sailors chosen for the program attend the college of their choice for three years before returning to the Navy as an officer after they receive a bachelor’s degree. After joining the Aggie family in 2009, Huber quickly immersed himself in student activities, including the Texas A&M Foundation’s student ambassador group, the Maroon Coats. 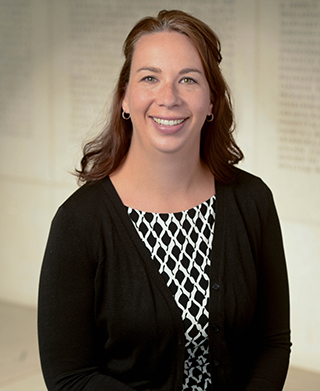 “Being a part of the Maroon Coats taught me that it takes a great deal of generosity and good will to not only ‘keep the lights on,’ but to give students the same outstanding education and out-of-the-classroom leadership experience year after year,” said Huber. Inspired from his time as a Maroon Coat, Huber established a planned gift through his life insurance policy to support scholarships and excellence funds for the Department of Communication and The Old Army Gentlemen’s Society, a social, service and leadership men’s organization on campus. In order to establish a gift of life insurance, donors must simply designate the Texas A&M Foundation as beneficiary in their policy. Life insurance gifts are ideal for younger donors who are still building their estates but wish to make a gift early in life. The policyholder can leverage a few hundred dollars in premiums to create a much larger gift and may also receive a charitable tax deduction depending on the gift’s structure. Though Huber will never get the opportunity to meet the Aggies his gift will support, taking advantage of his life insurance policy to give back to the university that changed his life was a personal and gratifying decision. You can support your favorite college, department or program at Texas A&M with a planned gift to the Texas A&M Foundation. For additional information about how to make a planned gift, contact Angela Throne ’03 with the Foundation at (800) 392-3310, (979) 845-5638 or athrone@txamfoundation.com.